Entered 2018 as the ninth-best prospect in the organization according to Baseball America ... Went 6-4 with a 4.25 ERA in 16 games (14 starts) with Milwaukee ... Had four stints with the team (5/13-5/20, 6/19-7/11, 7/25-8/29 and 9/9-end) ... Went 6-4 with a 4.40 ERA as a starter (73.2ip, 36er) and 0-0 with a 1.93 ERA in relief (4.2ip, 1er) ... His last 2 appearances of the season came out of the bullpen ... The team went 9-5 in his starts ... Produced 6 quality starts, going 5-1 with a 1.42 ERA in those starts (38ip, 6er) ... Held opponents to a .178 batting average with 96 strikeouts in 78.1 innings ... Made his Major League debut on 5/13 at Colorado and earned a 7-3 victory.....took a no-hitter into the sixth inning (5.2ip, 1h, 0r, 2bb, 13k).....only hit allowed was a single to David Dahl ... Became the ninth pitcher (13x) and first rookie in franchise history to have at least 13 strikeouts in a game.....tied Cliff Melton (1937 Giants) for the fourth highest total in a Major League debut ... Collected 10 strikeouts over 7.0 innings in a 5-1 win on 6/26 vs. Kansas City (1h, 1bb) ... Went 6-2 with a 3.10 ERA in 13 starts at Triple-A Colorado Springs ... Held Pacific Coast League opponents to a .218 batting average with 87 strikeouts in 61.0 innings ... Made 1 start at Class-A Wisconsin after he was optioned there on 7/12 (before the All-Star break) ... Made his postseason debut in Game 4 of the NLCS at Los Angeles and tossed 3.0 scoreless and hitless innings (3bb, 6k).....was his only outing of the postseason ... Pitched for Este in the Dominican Winter League. Went 3-8 with a 2.63 ERA and 1 save in 25 games (19 starts) between Class-A Carolina and Double-A Biloxi.....held opponents to a .178 batting average with 169 strikeouts in 120.0 innings... His 169 strikeouts led Brewers farmhands and tied for ninth in all of Minor League Baseball... His 2.63 ERA ranked second among all Brewers minor leaguers (0.8ip/team game)...Began the season at Carolina, where he went 1-3 with a 3.04 ERA in 12 games (8 starts) while holding opponents to a .189 batting average with 78 strikeouts in 56.1 innings... Was a Carolina League All-Star... Was transferred to Biloxi on 6/22 and went 2-5 with a 2.26 ERA and 1 save in 13 games (11 starts) while holding opponents to a .167 batting average with 91 strikeouts in 63.2 innings... Named Brewers Minor League Pitcher of the Month for August/September (6g, 5gs, 1-2, 1.27era)...Was added to the 40-man roster on 11/20... Enters 2018 as the ninth-best prospect in the organization according to Baseball America. Went 4-4 with a 3.62 ERA and 2 saves in 24 games (10 starts) between Class-A Wisconsin and Class-A Brevard County ... Held opponents to a .235 batting average with 97 strikeouts in 82.0 innings ... Began the season at Wisconsin, where he went 4-1 with a 2.85 ERA and 2 saves in 16 games (8 starts) while holding opponents to a .202 batting average with 77 strikeouts in 60.0 innings ... Was a Midwest League All-Star ... Was named Brewers Pitcher of the Month for June (5g, 3gs, 2-1, 1.59era) ... Was transferred to Brevard County on 7/9 and went 0-3 with a 5.73 ERA in 8 games (2 starts) as opponents batted .321 with 20 strikeouts in 22.0 innings. 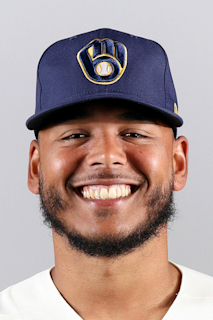 April 16, 2019 Milwaukee Brewers placed RHP Freddy Peralta on the 10-day injured list. SC joint injury. September 9, 2018 Milwaukee Brewers recalled RHP Freddy Peralta from Colorado Springs Sky Sox. August 30, 2018 Milwaukee Brewers optioned RHP Freddy Peralta to Colorado Springs Sky Sox. July 25, 2018 Milwaukee Brewers recalled Freddy Peralta from Wisconsin Timber Rattlers. July 12, 2018 Milwaukee Brewers optioned RHP Freddy Peralta to Wisconsin Timber Rattlers. June 19, 2018 Milwaukee Brewers recalled Freddy Peralta from Colorado Springs Sky Sox. May 21, 2018 Milwaukee Brewers optioned RHP Freddy Peralta to Colorado Springs Sky Sox. May 13, 2018 Milwaukee Brewers recalled Freddy Peralta from Colorado Springs Sky Sox. March 9, 2018 Milwaukee Brewers optioned RHP Freddy Peralta to Colorado Springs Sky Sox. November 20, 2017 Milwaukee Brewers selected the contract of Freddy Peralta from Biloxi Shuckers. June 22, 2017 RHP Freddy Peralta assigned to Biloxi Shuckers from Carolina Mudcats. July 9, 2016 Freddy Peralta assigned to Brevard County Manatees from Wisconsin Timber Rattlers. April 4, 2016 RHP Freddy Peralta assigned to Wisconsin Timber Rattlers. December 9, 2015 Milwaukee Brewers traded 1B Adam Lind to Seattle Mariners for RHP Carlos Herrera, RHP Daniel Missaki and RHP Freddy Peralta. June 19, 2014 RHP Freddy Peralta assigned to AZL Mariners. June 5, 2013 RHP Freddy Peralta assigned to DSL Mariners. April 18, 2013 Seattle Mariners signed free agent RHP Freddy Peralta to a minor league contract.